How does Gemini Dot Tag Works ? 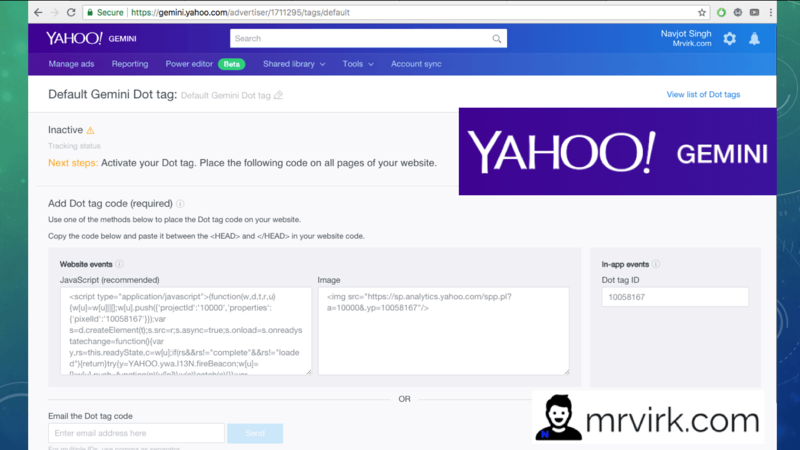 This article will teach you How to Implement Yahoo Gemini Dot tag on your wordpress website. Dot Tag is Yahoo’s universal tracking tag (used for other Yahoo Platforms along with Yahoo Gemini). For, this article we will focus on Dot Tag’s significance in relation to Yahoo Gemini. Dot tag is used to communicate website and app events to track performance and optimize your advertising Campaigns (Yahoo search, native and display campaigns). Dot tag also enable you to leverage retargeting and advanced audience targeting for various Yahoo channels. Dot tag is also referred as Pixel, so don’t be confused if you come across the word. Using a single pixel, you can manage multiple objectives, like creating new audiences for retargeting and tracking website conversions, mobile app installs and in-app user behavior. This Dot Tag code is then placed on website in the <head> here </head> tags. Once implemented, Dot tag sends event data to Yahoo for use with your Yahoo advertising campaigns. The event data may be either through standard or custom implementation of Dot tagging. In the standard Dot implementation, you place the tag in the <head> of every page on your website to transmit standard HTTP header information for each page a user visits, most importantly the URL of the page. The more advanced option lets you send custom event parameters that transmit more complex event data (e.g., check out with a cart value of $ 25.99). You can then use the event data collected through your Dot tag to define specific conversion rules or retargeting segments. Now lets, look at How we will implementing Dot tag code on a WordPress Website. 1- You must be logged into your wordpress website. 2- You must be logged into your Yahoo Gemini Account (quick link to yahoo gemini opens in a new tab, so you can login if not already). Now, firstly open your Gemini Account page. Now, Click the Gear Icon on the Top Right. On this page you will see your Dot tag code. Or use the Default Gemini Dot Tag. or login not already – you can login to wordpress by placing /wp-login.php behind your website url. Now, we need to Edit – header.php file. Follow the steps below to find your header.php file. Now our next step is to copy Dot tag code from Gemini and place in <head> </head> tag. To Watch a Video Tutorial on How to add code to head tag in wordpress ? Click here – Watch Video tutorial or follow the steps below. As you can see in this example, now paste your Dot tag code just above the closing tag. Previous articleWhat is Yahoo Gemini Dot Tag ?